For Jack & Deana's wedding last month, Clint asked our friends Lee & Mary Jean Wilson if we could borrow their team of horses and surrey. They graciously said yes, and they were such a hit! Don't be surprised if you see a different team of horses taking up residence at Double M in the future - Patsy loved them and I think is hooked on having a team here too. The team brought Deana and the flower girls in, and took the newly married couple away from the ceremony! 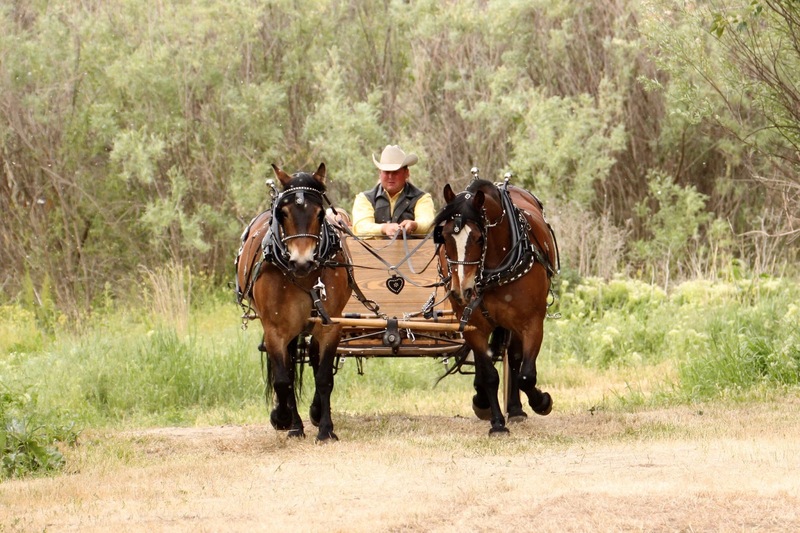 The Wilson's team is comprised of a gelding & a mare, and their names are Bonnie and Clyde. I'm not sure if they are siblings or not, but they look like it. Clint taking the team on a dry run before hitching them up. Mary Jean drives them in parades all over - even the Rose Parade. So when Clint harnessed them for the first time here at the ranch, they acted like true professionals. You could tell they had been driven a lot, and they were both VERY well mannered. I told Clint if he'd have charged a $1 for a ride, he could have retired after the wedding. I had the best time taking pictures of them, and thought I'd share here. Thanks for letting me indulge in that. Also, thank you to Tyler & Trevor who helped hitch up, and hold the team during the ceremony. We appreciate your help guys! And again - a BIG THANK YOU to Lee & Mary Jean for letting us borrow them! PS - I'll end with one of my favorite pictures of Clint from this year. He's relaxed, totally in his element and looking sharp in his hat.